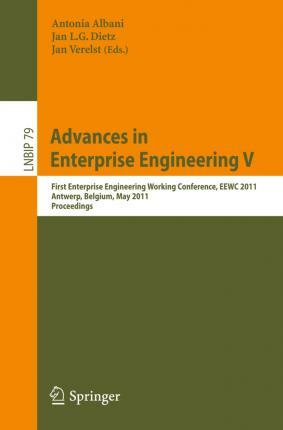 This book constitutes the proceedings of the first Enterprise Engineering Working Conference (EEWC), held in Antwerp, Belgium, May 16-17, 2011. EEWC aims at addressing the challenges that modern and complex enterprises are facing in a rapidly changing world. The participants of the working conference share the belief that dealing with these challenges requires rigorous and scientific solutions, focusing on the design and engineering of enterprises. The goal of EEWC is to stimulate interaction between the different stakeholders, scientists as well as practitioners, interested in making Enterprise Engineering a reality.The 8 papers presented were carefully reviewed and selected for inclusion in the book. EEWC 2011 had 24 submissions of which 8 were accepted for publication. The topics of the papers encouraged active participation in interesting discussions and the exchange of ideas, and stimulated future cooperation among the participants. This made EEWC a real `working conference' contributing to the further development of Enterprise Engineering as a mature discipline. The topics covered include designing organizations with DEMO, combining DEMO with other methods, and studies in enterprise architecture.